A Yacht Charter Holiday sailing among the independent islands of Antigua (pronounced by locals as antiguh and not antigwu) and Barbuda were once British and you will see the influence, but there is a strong local West Indian flair. 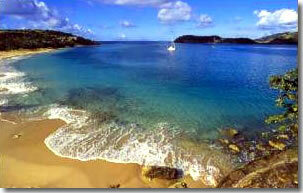 The islands have many gorgeous unspoiled beaches and coves to explore. The sample itinerary below starts at Jolly Harbor where you pick up bareboat rentals, but you may meet your crewed yacht in Falmouth or English Harbor as well, which would customize your charter itinerary differently. Venture out into the calm, protected water on the leeward side of the island, hoist the sails and enjoy a leisurely cruise. 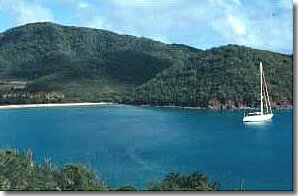 Just to the North of Jolly Harbour (a mere half-hour’s sail if you go direct) you will find Deep Bay. Drop anchor and dive or snorkel on the wreck of the ‘Andes’, a three-masted barque that lies in 20 feet of water. In the evening go ashore for a traditional island meal and dine on the beach to the accompaniment of a calypso band or enjoy a sunset meal aboard. Set sail to North Sound. Choose from Jumby Bay on exclusive Long Island, nearby Maiden Island or Great Bird Island on the inner edge of the protective reef. Take your dinghy and explore the many beautiful, sheltered bays only easily accessible by boat. 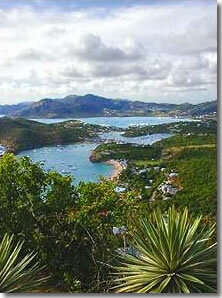 Continue to explore this magical area, and in the late afternoon drop anchor in Dickenson Bay. If you crave some action this long Beach is the place for watersports, nightlife on the beach, casinos and restaurants. Get an early start for an invigorating sail to Barbuda. This timeless island is only visible from within a few miles. 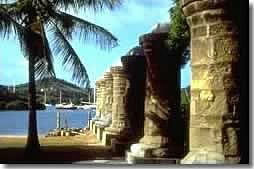 It is a long, flat sun drenched paradise. Overnight off the beautiful pink shelled beach just to the Northwest of Cocoa Point and enjoy dining on your yacht under the stars. 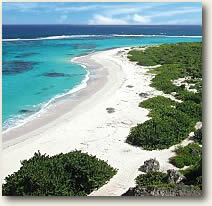 Barbuda has an abundance of colourful coral reefs and amazing beaches not to be missed. For bird lovers, a visit to one of the world’s largest Frigate Bird sanctuaries is a must. Take a stroll along Eleven Mile Beach and admire the soft, pink powder sand. In the village of Codrington, you can enjoy a very reasonably priced lobster dinner at a local restaurant. Set sail back to Antigua. Enjoy a ‘power reach’ southwards to Nonsuch Bay on the East Coast of Antigua, dropping anchor at West Bay on uninhabited Green Island. Time for a swim and fire up the BBQ while sipping a sundowner. Jump in the dinghy and explore Nonsuch Bay. Inside its protective reef, you will find some of the best snorkeling in the area – a place most folks find hard to leave. Back on mainland Antigua, visit Harmony Hall, a converted Sugar Mill, which houses an excellent, Italian-owned bar and restaurant, together with an art gallery and spectacular scenery. A brisk two to three hour sail along the rugged Southeast coastline, past the unusual rock formation of the Pillars of Hercules, and into English Harbour. Moor stern-to at the famous Nelson’s Dockyard, the only remaining working Georgian Dockyard in the world. Wander around the beautifully restored buildings dating back to the early 18th Century and soak up the historical atmosphere. Include a visit to the museum. Take a short taxi ride up to Shirley Heights for a magnificent view of the Southeast corner of the island and enjoy a sundowner as the skies turn from blue to crimson. Head back down to the Dockyard to enjoy dinner in one of the many restaurants or a scrumptious meal aboard. Sail out of English Harbour and sail downwind to picturesque Carlisle Bay with its calm, clear, palm-fringed waters for a truly “away from it all” night if you intend on more than 8 days charter. A great little beach bar on the beach serves West Indian food and provides an ideal spot to hang out with the locals. Continue the downwind sail inside Cades Reef, enjoying the calm, turquoise waters. Drop the hook behind the reef for a snorkel and then lunch. Carry on North along the beach-studded West Coast, past Jolly Harbour and anchor off Hermitage Beach in the beautiful, protected bay of Five Islands Harbour. Enjoy a leisurely start on your final morning before a short sail back to Jolly Harbour with time to spare for your debrief and a last chance to buy some mementos after your memorable cruise. Browse the available crewed sailing and motor yachts for an Barbuda Antigua Sailing Charter with a Yacht Search.